Bloomington and South-Central Indiana are home to some of the nations most beautiful running routes. The rolling hills of southern Indiana are interspersed with stretches of flat land providing a great mixture of terrain for long runs and fast races. Discover Local Running Routes below, or send us your own for inclusion here. All Links are verified periodically, however, if you find a broken link please let us know by contacting us throught the address noted below. Send Running Route Messages to info@indianatrackclub.com. USA Track & Field: Over 450 local running routes can be found at the USA Track & Field web site for the Bloomington, Indiana area. Indiana University 8K Cross Country Course: on the campus of Indiana University. 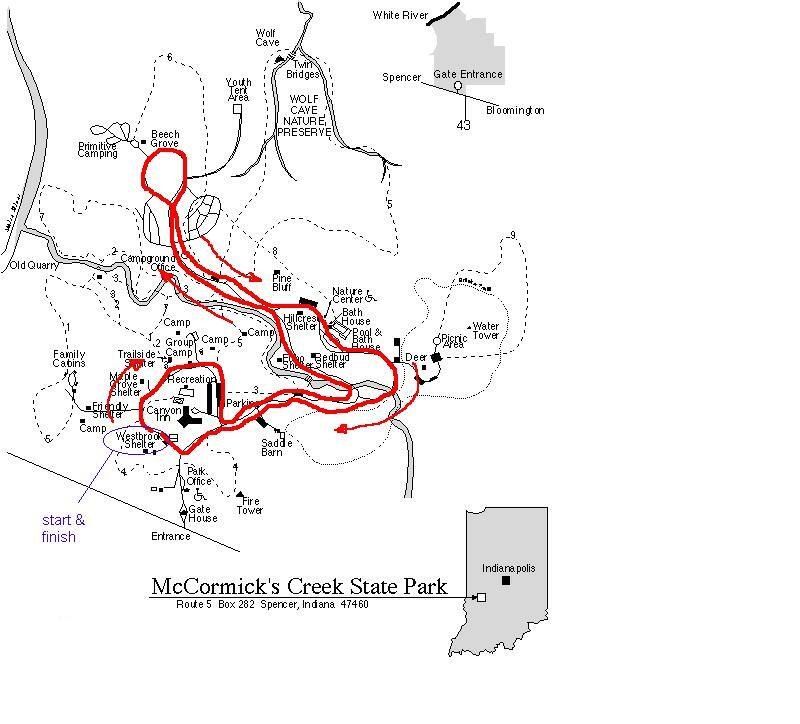 McCormick's Creek State Park: 4.6 mile loop course. Runner's World, "This quintessential college town is in the heart of the Hoosier state" (online version), By: Doug Rennie. Published 1/23/2002: Bloomington, Indiana, was featured in the "On The Run" column published January 23, 2002 in Runner's World magazine. "Exploring Bloomington One Run at a Time" From the Bloomington, Indiana, Herald-Times.